Peter Wallner‘s two-volume biography of Franklin Pierce is the most recent comprehensive look at Pierce’s life and presidency. 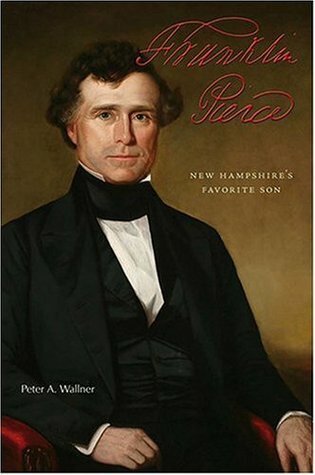 The first volume is “Franklin Pierce: New Hampshire’s Favorite Son” published in 2004. Prior to writing this biography Wallner moved to New Hampshire in order to more fully research Pierce’s life. Previously he was a history teacher; he is now a professor at Franklin Pierce College. This first volume covers Pierce’s life from his childhood to his first night in the White House as the nation’s fourteenth president. These forty-eight years encompass his childhood, his college education at Bowdoin, his earliest days as a politician in the New Hampshire state legislature, his service in Congress (both the House and the Senate) and his leadership as his state’s Democratic party boss. Wallner’s biography is the first major effort in over seventy years to re-assess Pierce’s life and presidency. Happily it proves very well researched, extremely comprehensive, wonderfully descriptive and incredibly detailed. And where some authors seem to provide detail in an effort to overwhelm or exhaust their readers, Wallner’s level of detail is perfectly calibrated to add color without being burdensome. His writing style, though not quite comparable to authors like McCullough, is expressive, well-paced and effortless to read and understand. Wallner’s view of Pierce is far more favorable than history’s judgment of this former president. But his sympathy presents itself clearly, without being clumsy or obtuse. This first volume, of course, merely represents the ascension of a future president, so the author’s supportive view in this phase of Pierce’s life is not only unsurprising…it may actually be deserved. Wallner’s treatment of Pierce’s presidency, certain to be well-described in the second volume, deserves to be judged in its own right. More often than not, biographies about unsuccessful and largely forgotten presidents prove somewhat bland and uninteresting. In this first of two volumes on Pierce’s life, however, Wallner undertakes the daunting task of holding the reader’s interest by animating Pierce and portraying him as multi-faceted, eager to serve and likable. Wallner also takes the complex social and political issues of antebellum America and makes them comprehensible – even to readers without a deep background in American history. What I appreciated most about Wallner’s biography was how he carefully tracked Pierce’s political philosophy and his views on a variety of issues over the course of his career. In this manner Wallner demonstrated a consistency in Pierce’s political approach which blunts some of the criticism Pierce receives from his harshest critics. The most common objection relating to Wallner’s biography is that it goes too far trying to repair Pierce’s damaged reputation. At certain times the author does seem to work breathlessly to paint a flattering portrait of Pierce; occasionally the author comes across as slightly defense or apologetic on Pierce’s behalf. But more often, Wallner articulately explains his perspective alongside the conventional view of Pierce on an issue, allowing the reader to reach his or her own conclusion on the matter. Wallner is also prone to making broad, sweeping generalizations that may or may not be true (particularly near the book’s beginning). These statements are generally worded in such a way that they are difficult to disprove but equally challenging to wholly support. The author’s commentary which falls under this spell is invariably supportive of Pierce’s character or legacy. Overall, this first volume of Wallner’s biography on Franklin Pierce is a refreshing, lively and engaging review of Pierce’s pre-presidency years. For both the novice as well as the advanced scholar this book provides unique insight into Pierce without becoming laborious or tiresome. With this book weighing in at just over two-hundred-fifty pages, it is unclear why Wallner (or the publisher) felt it necessary to separate Pierce’s life into two pieces. Nevertheless, readers of Wallner’s first volume on Franklin Pierce will be eager to dive into the second volume without hesitation. I’m glad you pointed out that this is actually the first of two books, because I only had this one on my reading list. Upon reading the title I had a feeling it was going to be just a little biased on the positive side – and I know that people from New Hampshire can be very possessive of their “favorite son”. I’m glad to know that it wasn’t a bad read.